Q. As a pool owner, I have a general idea of how to keep my pool water clean. But frankly, I’m not sure I’m doing it right. How can you help me? A. Surprisingly, most pool owners don’t really feel confident about the way they maintain their pools. That’s why we wrote this FAQ Sheet. A. Pretty common, is more like it! Look, a swimming pool is a sophisticated piece of equipment. Nobody expects you to know everything about it without asking questions or you'll find yourself with a messed-up pool. Q. O.K., then. Let me ask you this: exactly what is a ‘properly maintained’ pool, anyway? A. A properly maintained pool is one that is visually and biologically clean. Q. I can tell if it’s visually clean just by looking at it. But how do I tell if it’s ‘biologically clean’? A. 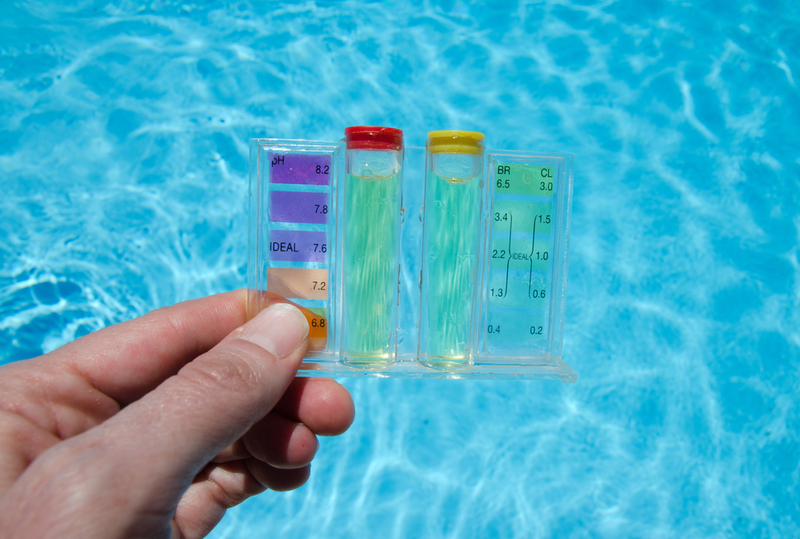 By using a test kit, and measuring your pool’s chlorine, Alkalinity and pH levels. (This is a very easy procedure and your pool supply dealer will be happy to show you how it’s done.) So, if you maintain the proper chlorine and PH levels, bacteria and algae will be killed, and your pool will be "biologically" safe. Q. I’ve heard of chlorine before, but I’m still not really sure what pH is. A. "pH" refers to the acidity/basicity level of your pool water. The reason it’s important is that unless your pool is within a certain pH range, your chlorine can’t chemically interact with the bacteria and algae it’s supposed to kill. Q. In other words, unless my pH range is properly adjusted, chlorine won’t help keep my pool as clean as it should be? A. Exactly. Most pool owners don’t realize how important the pH level is. The proper range is 7.2-7.8, ideally 7.6. Q. Since it is so important, how do I maintain it? A. That’s easy. All you have to do is: 1: Measure your pool’s current pH level 2: If the level is too high (your test kit tells you how to determine that), add "pH MINUS" 3: If the level is too low, add "pH PLUS." Q. Where do I get this ‘pH minus’ & 'pH plus’? A. 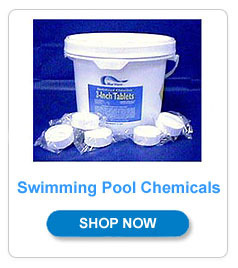 Your pool chemical dealer has it. It’s not expensive, but it is critical. Q. O.K. now that my pool’s pH is balanced what do I do? A. You add chlorine. The idea is to maintain a Free Residual Chlorine level of 1.0-1.5ppm. Q. That’s a new one for me. Just what does ‘Free Residual Chlorine’ actually mean? A. ‘Free Residual Chlorine’ is the amount of chlorine that remains available to kill bacteria and algae as they occur in your water. Q. O.K. how can I be sure I always have enough ‘Free Chlorine’ in my pool? A. Simple. Just ask your pool chemical dealer for a test kit that measures the ‘Free Chlorine’ level. It’s easy to use and you should use it daily. Q. But aren’t there different types of chlorine? A. Yes, but basically we recommend just one type. A. Any chlorine ( either granular or in tablet form ) that is what they call a "Stabilized Tri-chlor" type. A. Because it’s very effective in fighting bacteria and algae, it’s very easy to use, and it lasts up to 4 times longer than liquid bleach, shock or calcium hypochlorite. Q. C’mon. Is there really a difference? A. Yes. A Stabilized Chlorine may cost a little more initially, but will save you money in the long run. It protects the chlorine from the sun's damaging rays. Q. I guess I can see the advantages of Stabilized Chlorine - tell me more. A. The sun will cause liquid bleach or shock and calcium hypochlorite to lose their effectiveness after 4 hours. But if you use a chlorine with a built-in-stabilizer, it will keep working for over 24 hours. More chlorine is left in the water to do the job of sanitizing, and less is wasted - being burned off by the sun. A smaller amount of Stabilized Chlorine will last you longer than 2-3 times as much unstabilized chlorine. Q. O.K. I’m convinced that Stabilized Chlorine is better than the others. Now what do I do? A. You have a choice of either Stabilized granular chlorine or Stabilized tablets. For most applications, we usually recommend using the 3" slow dissolving "hockey puck" style tabs. Q. OK, but say I did select the granular. How do I use it? A. Easy: Once your pH is balanced, simply add 2 ½ ounces of most brand's granules for every 10,000 gallons of water. However, be sure to check the label of the brand you choose. A. You do have to add it every day unless otherwise indicated by your test kit. This is this disadvantage of a granular product. Q. Do I just sprinkle it right into the water? A. No. You should mix it with water in a bucket first. This will ensure that you don't stain your pool bottom. Remember, always add chemicals TO water, not water TO chemicals. Q. Sounds easy, but I think the tablets would be easier. Am I right ? A. Yep. Simply place the tablets either into your skimmer basket or, if you have one, your chlorine feeder. Usually only once per week ! A. The same as with the granules: 2 ½ ounces per 10,000 gallons is typical, however be sure to check the label of the brand you choose. Q. How can I tell how many gallons my pool holds? A. There is a chart on our Web Site, go back one page to the main Pool & Spa Tips Information Directory and you'll see it. Q. You make it out to sound pretty simple. Basically, it seems like all I have to do is keep my pH balanced and my chlorine level up. A. You’ve got it! The only other bit of routine maintenance you need to know about is vacuuming, super-chlorinating, and maintaining total alkalinity. Q. Vacuuming I know about: once a week I vacuum the bottom and sides and then backwash my filter. But what’s super-chlorinating, and how often do I do it? A. Super-chlorinating is just what it sounds like: Instead of putting in 2 ½ ounces of chlorine per 10,000 gallons, you put in 5-10 times that amount. Q. Wow! That’s a lot! A. True, but you do it only when needed, usually after a heavy rain, a very hot weekend or when the pool’s been heavily used. Before swimming, you must wait until the free residual chlorine has returned to below 3 ppm. Q. Got it. Now what’s total alkalinity, and why do I have to test for it? A. This is the water’s ability to resist changes in pH. The same conditions that produce the need to Super-chlorinate may also affect your water’s total alkalinity. A simple test kit will help you keep total alkalinity at the proper level of 80-120ppm. 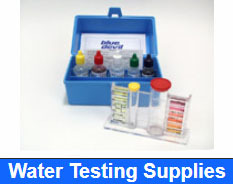 Your pool chemical dealer can supply the test kit and the chemicals you need. Q. What you’ve told me is really helpful. For the first time I think I really understand how to maintain my pool, and I feel confident about it. But I’m sure that during the summer I’ll have questions. A. First of all, you can always return to our Web Site and email us a question, or call us at 1-800-876-7647 or 1-702-437-4343 . Also, we’d like to remind you that your local pool supply dealer is an expert and is always ready to help answer your questions as well. Information on this page was adapted from "The Basic Guide To Pool Maintenance" - FMC Corporation - and is intended as a basic guideline only. Consult the instructions on your specific brand of chemicals for proper use and safety instructions.